People from different parts of the world live in the cultural capital of Russia. Walking around St. Petersburg, you can often see the Oriental peoples. At the moment, the approximate number of Chinese residing in St. Petersburg is about five to six thousand. The first native of China, who settled in the city on the Neva - Zhou Ge. He was named Fedorov Petrov. Zhou was the translator of the College of Foreign Affairs and came to the Northern capital in 1737. In Russia, he was given the rank of ensign. Given the number of Chinese people, as well as the interest in the very culture of China, the city has many places where you can delve into the tradition and get to know the history of the East. 1 "The Garden of Friendship"
9 Network of Chinese restaurants "Harbin"
12 The residential complex "Baltic Pearl"
Pagoda of friendship. Near the entrance there are two guard-lions, similar to Shih Tzu. The outdoor area is meant for tea ceremonies, rest and meditation. Nine dragons. Dragons are considered to be sacred animals in China. They drive away evil. Dragons adorn the wall. Trees. Which garden can be without trees. Besides pines - symbols of courage, willows - femininity and apple trees, which represent fertility, in the garden grows real cherry. In the lower park, near the Monplaisirsky Palace in Peterhof was built a Chinese garden in the XIX century. Here you can see winding colored paths, whitish bridges over streams. In the center of the garden there is the pedestal "Cupid and Psyche". And, of course, what Peterhof without fountains! The Chinese place is completely executed in the oriental style. Tired of the gracefulness of Peterhof, a tourist can relax in the kindergarten. In China, at the entrance to the palaces and temples put a pair of lions - guards. A ball in the paws of the king of beasts - a symbol of knowledge that can fulfill any desires, a lioness is called to guard a cub. Similar sculptures from granite are on the embankment of "Petra", on the sides of the staircase leading to the Neva. Lions in 1907 were taken from Girin, as a gift to St. Petersburg from General Grodekov. And since then they have been fulfilling the wishes of the passers-by of Petersburgers and guests of the city. Petersburg is the cultural capital of Russia. Residents of the city, as well as tourists, can get acquainted with the literature and traditions of the east in the center of Oriental cultures. The Mayakovsky Library contributed to the opening of the center on the embankment of the Fontanka River. There is a large collection of books in various languages, lectures, movies, language clubs are also constantly held. At the opening of the center of Oriental cultures in St. Petersburg, representatives of the Chinese Consulate arrived. There was talk about further development in the spheres of culture, education and tourism between China and Russia. "Yellow Yard" is located at the address: Kovensky Lane, 14. The bookshop is located in the courtyard. The name appeared because of the Chinese canon of the Middle Ages, which states that there are three courts for each person: the first is in the spleen, the second is in the heart, and the third is in the head. The store is located in the second courtyard, respectively in the heart. Another, more simple version is that all the courtyards of St. Petersburg are yellow, if you pay attention to it. In the "Yellow Yard" a large selection of eastern literature, both in the original language, and translated into Russian. In addition, the bookstore often hosts film screenings, lectures on Oriental studies and literary presentations. In the XVIII century there was a fashion for chinoiser, which means "chinese". It was then that Catherine II ordered the construction of a village in the Chinese style. Unfortunately, out of 18 conceived houses only 10 were completed. The village is surrounded by three bridges. Cross bridge, the Great Chinese bridge with four sculptures of the Chinese, which were destroyed in the Great Patriotic War, but restored in the present time. And the third, the Dragon Bridge, decorated with four figures of dragons waving their wings. Now the houses of the Chinese village serve as residential and guest apartments. In the city of Lomonosov there is a palace and park ensemble "Oranienbaum", in whose territory the Chinese palace is located. 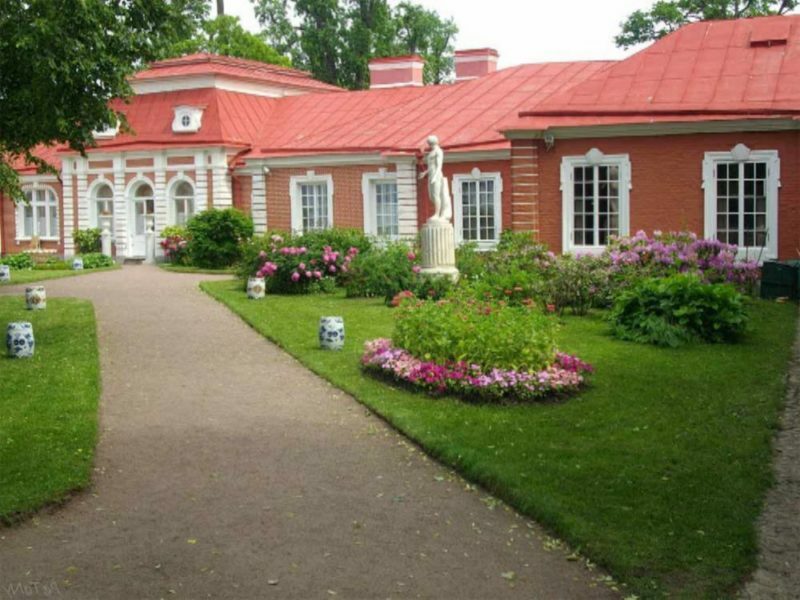 It was built by order of Catherine II, who wanted to have her own dacha. A distinctive feature of the palace is that it became a museum even before the war began, and it did not suffer from shelling during active hostilities in Russia. The palace is the only one in the country executed in the Rococo style. It is famous for its rich interior decoration and has no analogues anywhere. Hanban, or the office that distributes Chinese abroad, has formed a global network of Confucius Institutes. One of the branches is St. Petersburg State University, Oriental faculty. The Institute strengthens friendship between China and Russia, studying culture and language, and sending students to China for an internship. It is in the St. Petersburg branch of the Institute is the point of passing international tests in the Chinese language. For lovers of real Chinese cuisine and collection teas in the northern capital of Russia, there is a whole network of 15 restaurants in Harbin, located in different parts of the city. In the restaurants you can feel the atmosphere of China. The interior is made in the appropriate style. And in the menu there are dishes straight from Beijing. There is an opportunity to try a duck in Beijing, cooked according to the original recipe, as are sweet and sour sauces, so popular in the east and many other tasty dishes. The Russian State Pedagogical University named after Herzen ranks third in the number of Chinese students. Thanks to this fact, from the school there is a dining room with Chinese cuisine. Any tourist or a Petersburger can taste dishes that are cooked according to oriental recipes at an inexpensive price, but at the same time very tasty. "China Town" - a huge shopping complex, in which everyone can find the right thing. On the shopping counters there is a large selection of goods from Chinese manufacturers. In TC there are more than one hundred stores attracting customers with low prices and good quality. "China City" - an excellent alternative to ordering goods on Chinese websites. Here you can see, die and buy the right thing without intermediaries. In the shopping center come for shoes, clothing, cosmetics, appliances, dishes, furniture and much more. There are also various entertainment events on the territory of the "China Town". And for the tired and hungry there are cafes and restaurants with national dishes. The authorities of St. Petersburg and Shanghai agreed on the project of the "Baltic Pearl" in 2004. On the shore, along the Gulf of Finland, a new and quite large microdistrict is being built up. At the moment, many houses are already inhabited, some still continue to cost. In the apartments of the residential complex is a beautiful view, the area looks like a European. Thanks to Chinese investors in the south-west of St. Petersburg, apart from residential buildings, there are entertainment, shopping and business centers, hotels, bars, cafes. Also the territory is reserved for medical, sports and educational institutions. In the neighborhood there will be beautiful parks where you can walk with your family.